To evaluate optical coherence tomography/scanning laser ophthalmoscopy (OCT/SLO) imaging for optic nerve head drusen (ONHD). Nine consecutive eyes with ONHD were imaged. Each underwent visual field testing, 20-MHz B-scan ultrasonography, photography, and OCT/SLO imaging of the nerve head. Similar evaluation was performed on 12 matched, disease-free control eyes for comparison. OCT/SLO imaging of ONHD demonstrated lucencies (100%), variable amounts of displacement, and thickening of the overlying nerve fiber layer, as well as disorganization of the adjacent retinal pigment epithelium (44%). Optic nerve head topography was measured (using horizontal and vertical electronic calipers). Mean disc diameter was 1.81 mm (range: 1.49 to 2.12 mm). All ONHD demonstrated anterior displacement of the base of the optic nerve cup (shallowing) compared to controls. The cup base was a mean +0.32 mm anterior to the retinal pigment epithelium for ONHD versus −0.23 mm for normal controls. OCT/SLO revealed unique and clinically helpful views of ONHD. From The New York Eye Cancer Center (NNP, JPS, KJC, PTF), New York, New York; New York University School of Medicine–Manhattan Eye, Ear and Throat Hospital (NNP, PTF), New York, New York; and The New York Eye and Ear Infirmary (JPS, PTF), New York, New York. Presented in part as a research poster at the Association for Research in Vision and Ophthalmology Annual Meeting, May 6–10, 2007, Fort Lauderdale, Florida. Supported by The Eye Cancer Foundation, Inc., New York, New York, and in part by an imaging grant from John and Myrna Daniels. Optic nerve head drusen (ONHD) are laminated, calcified, acellular hyaline concretions located in the prelaminar optic nerve. Clinically, they are categorized as either (1) visible drusen wherein protuberant excrescences are noted along the disc margin, hence the pseudopapilledema appearance, or (2) buried drusen, where they are characterized by obscure and/or elevated disc margins in common association with anomalous disc vasculature. Currently, there are multiple manufacturers and models of OCT imaging systems. Optical coherence tomography/scanning laser ophthalmoscopy (OCT/SLO) is a next-generation high-resolution (≤ 8 μm) imaging modality. A light of 820 nm generated from a common superluminescent diode light source is employed to register simultaneous tomographic OCT and topographic SLO images. As a result, the OCT and SLO image sets are combined and cross-correlated pixel-to-pixel. In addition, this system offers unconventional (eg, coronal) imaging angles and quantitative analysis where lesions can be measured with digital calipers. As a result, the examiner can precisely identify the intraretinal or intraneural morphology of a lesion by referring to the corresponding SLO fundus map. We believe that with the serial application of this combined imaging technology to the study of ONHD, its pathogenesis and natural history may be further elucidated. Previous OCT-based studies have evaluated nerve fiber layer thickness changes and scleral canal size. To our knowledge, this is one of the first studies that describes intraneural characteristics of ONHD. Herein, we describe a series of eyes with ONHD where OCT/SLO imaging revealed unique clinical information suggestive of objective parameters that can be followed for progression. At The New York Eye Cancer Center, 21 eyes were selected for inclusion in this consecutive clinical case series with age-matched controls. Nine eyes of seven patients with irregular disc margins were diagnosed as having ONHD based on ophthalmoscopy, ultrasonography, and fundus autofluorescence. Twelve eyes of eight age- and gender-matched volunteer subjects with no abnormal clinical or ultrasonographic evidence of optic nerve pathology were selected as controls after consent was obtained. This study was conducted in accordance with the tenets of the Declaration of Helsinki and the United States Health Insurance Privacy and Portability Act of 1996 and was approved by the Institutional Review Board of The New York Eye Cancer Center. Patients with a history and optic nerve examination results suggestive of alternate pathologies (ie, increased cupping consistent with glaucoma or diffuse and/or sectoral pallor resulting from optic neuropathy) were excluded from both study groups. Also, subjects with peripapillary atrophy were excluded from the control group. The presence of ONHD was confirmed by 20-MHz ultrasonography, which demonstrated a hyper-echoic area at the level of the nerve persisting on a low-gain setting, and fundus autofluorescence using a camera-based system (Topcon TRC-50IX; Topcon Medical Systems, Inc., Paramus, NJ), revealing discrete single or multiple foci of positive autofluorescence. Patients underwent automated SITA standard 30-2 Humphrey visual field testing (Humphrey Systems, Dublin, CA) at initial and subsequent follow-up visits. The optic disc region of each eye was imaged by conventional stereo disc photography and OCT/SLO system (Ophthalmic Technologies Inc., Toronto, Canada) after pharmacologic mydriasis. Cross-sectional images of each subject were taken using a C-scan (coronal) mode followed by a B-scan (longitudinal) mode. The scanning depth was performed at 1.5 mm, the scan rate was 1 Hz (frame/second), and the scanning angle was 29.2°. For each OCT/SLO study, a single B-scan was selected such that the optic cup was in-line with the drusen while avoiding traversing blood vessels at the margin. The grayscale vertical bar images were used to check the integrity of the image during the scanning session by looking for distortion, usually secondary to motion or blink artifact. Scanning was repeated until no artifacts were noted. Specific aspects of the optic nerve head topography were measured on the cross-sectional B-scans using horizontal/vertical calibrated electronic calipers specified by a single observer. Patient demographics and optic nerve imaging data are summarized in the table. The ONHD cohort included four men and three women, with an age range of 25 to 78 years and a mean age of 61 ± 17.8 years. All cases of ONHD were observable by both ultrasound and OCT/SLO. The control group also had a comparable gender and age distribution: twelve eyes of four men and four women with an age range of 27 to 79 and a mean age of 52 ± 18.8 years. The retinal pigment epithelium (RPE) was identified as the hyperreflective band noted below the junction of the inner and outer photoreceptor segments. Accordingly, disc diameter was measured as the distance between RPE termination on a cross-sectional B-scan that traversed the approximate geometric center of the nerve head (Fig. 1), as judged based on the accompanying SLO image. The range of disc diameters was 1.49 to 2.12 mm, with an average of 1.81 mm (standard deviation = 0.27 mm) for the ONHD group; for the control group, disc diameters ranged from 1.38 to 1.84 mm, with an average of 1.62 mm (standard deviation = 0.16 mm). In 6 of 9 eyes with ONHD (67%), the disc diameter determined by RPE termination appeared to be larger than the disc size referenced on the accompanying SLO image. In contrast, this pattern was not observed in any of the control eyes. Figure 1. Optical Coherence Tomography/scanning Laser Ophthalmoscopy (OCT/SLO) of Optic Nerve Head Drusen. (Left) Right Optic Nerve Photograph Demonstrating Superonasal/nasal Visible Drusen that Obscure the Disc Margin. (Right) SLO-Guided OCT B-Scan Through the Center of the Optic Disc Cup and Peripheral Nasal Drusen, Avoiding Traversing Blood Vessels at the Margin (see Grayscale SLO Image, Lower Right). Disc Diameter Is Estimated by Vertical Calipers Placed at the Retinal Pigment Epithelium (RPE) Termination Site. A Corresponding Horizontal Green Line Is Superimposed over the SLO En Face Image, Demonstrating a Larger Measured Disc Size on the Transverse OCT Scan than Appreciated by the SLO Image. Note also the Shallowed Optic Nerve Cup, Hyperreflectivity of the Visible Drusen with Nerve Fiber Layer Displacement (white Arrow), Underlying Posterior Shadowing (yellow Arrow), and RPE Disorganization. In comparing the optic nerve head, B-scan OCT images of our study patients versus 12 healthy controls, several qualitative features were evident. In 9 of 9 study eyes (100%), the central optic cup was significantly shallowed (Fig. 2, bottom), with the base of the cup higher than the level of the RPE in all eyes, and obscured by secondary displacement of the NFL in 3 eyes. This vertical shallowing was quantified by measuring from the inner interface of the hyperreflective RPE level to the base of the optic cup. For the normal or control nerves (Fig. 2, top), this height was measured at an average of −0.23 mm (range = −0.51 to +0.14), the negative sign denoting a relative shallower position of the cup base to the RPE. In eyes with ONHD, this average height was +0.32 mm (range = +0.18 to + 0.53 mm), with one patient demonstrating no central concavity characteristic of the cup base. The difference in these mean RPE-cup base distances between eyes with ONHD and control eyes was statistically significant (two-tailed t test; P < .0001). Figure 2. Optical Coherence Tomography/scanning Laser Ophthalmoscopy (OCT/SLO) of Normal Control and Optic Nerve Head Drusen. (Top) Transverse OCT/SLO Scan of Healthy Optic Nerve, Demonstrating Smooth Contour of Nerve Fiber Layer at Disc Margin, Converging to a Discernible Cup that Has a Base Shallower than the Level of the Retinal Pigment Epithelium (measured by Placing the First Horizontal Caliper at the Inner Aspect of the Red Stripe Designating the Retinal Pigment Epithelium, and Placing the Second Caliper at the Level of the Cup Base). In Each OCT/SLO Image, the Lower Right Hand Figure Demonstrates the Real-Time SLO Image. The Red Arrow Through the SLO Image Demonstrates Exact Positioning of the OCT Image. (Bottom) SLO-Guided OCT Image Is Demonstrating an Area of Hyperreflectivity with Overlying Nerve Fiber Layer Displacement (yellow Arrow) and Underlying Lucency. The Discernible Cup Is Significantly Elevated from the Reference Level of the Retinal Pigment Epithelium, Measuring 0.526 mm. Although all eyes had visible drusen, implying a relatively superficial location of the lesion, only 2 of 9 eyes demonstrated pronounced hyperreflectivity iso-intense or greater than characteristically observed for the pigment epithelium (Figs. 1 and 2). A more consistent observation was the presence of posterior shadowing corresponding in width to the overlying druse. Two eyes demonstrated two separate areas of shadowing, corresponding with the noncontiguous foci seen on the autofluorescence imaging (Fig. 3). The width of this shadow was similarly measured by horizontal calipers. Figure 3. Optical Coherence Tomography/scanning Laser Ophthalmoscopy (OCT/SLO) of Optic Nerve Head Drusen. (Top Left) Multiple Optic Nerve Head Drusen (arrows) Are Visible in the Right Eye. (Top Middle) Corresponding Autofluorescence Imaging Demonstrating Diffuse Optic Nerve Head Drusen, Grouped Nasally, Temporally, and Superiorly. (Top Right) Intersecting Plane Analysis of Optic Nerve Head Drusen. Transverse OCT Image Is Intersected with the SLO Fundus Image, Demonstrating a Three-Dimensional Displacement of Nerve Fiber Layer Secondary to Optic Nerve Head Drusen (arrow). 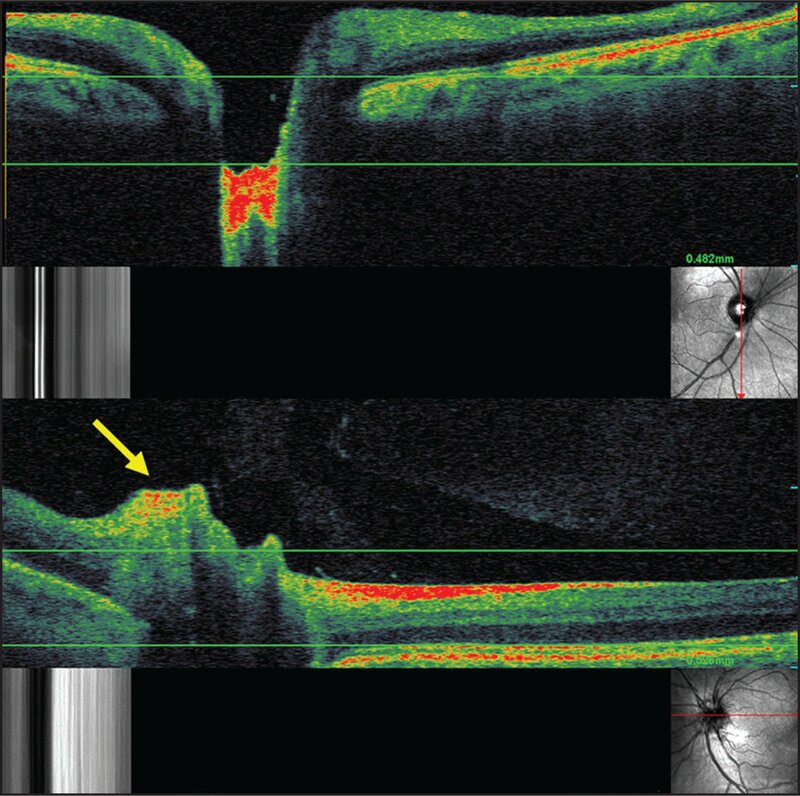 (B Ottom Left) OCT/SLO B-Scan Showing the Hyperreflective Temporal Drusen (yellow Arrow) with Underlying Shadowing and Adjacent Retinal Pigment Epithelium Disorganization (white Arrow). (B Ottom Right) OCT/SLO B-Scan Demonstrating Nasal Drusen with Shadowing and Overlying Displacement of the Nerve Fiber Layer. In Both OCT/SLO Images on the Bottom, the SLO Image Is Seen on the Bottom Right with the Red Arrow Indicating the Exact Positioning of the OCT Image. Peripapillary RPE demonstrated nonspecific albeit definite abnormalities. In 2 of 9 eyes, there was increased reflectivity of adjacent pigment epithelium; in 4 of 9 eyes, RPE was either not registered secondary to atrophy or shadowing from bordering drusen (Figs. 1 to 3). Note peripapillary atrophy related to alternate pathologies was not observed on fundus imaging, which can also cause confounding RPE disorganization and/or atrophy. Only 1 of 9 eyes was noted to have corresponding visual field defects with 30-2 Humphrey field testing. In two patients who were observed serially for more than 1 year, neither exhibited progression by OCT/SLO–based measurements or visual field defect in this short interval. The first objective measurement we propose for monitoring ONHD progression is the disc size (as determined by RPE termination). In our cohort, 6 of 9 eyes demonstrated a cross-sectional disc diameter (as measured by this technique) greater than the diameter appreciated on the en face SLO image. Because measurement features are not available for the SLO image, statistical significance for this difference could not be evaluated. Nonetheless, this finding is consistent with a recent study reporting a significantly larger disc size on OCT cross-sectional imaging than on digital and OCT fundus image, attributed to the overestimation caused by artifactual shadowing of the RPE by overlying vasculature or peripapillary atrophy.21 As such, cross-sectional images were selected to traverse the geometric center of the disc and ONHD, but to avoid the passage of rim vessels. Although marginal drusen may also shadow adjacent RPE and overestimate disc size, a progressive increase in this measurement on a similarly oriented B-scan may indicate morphologic progression of the drusen. Note that for all control group eyes, the disc size as determined by RPE termination on the OCT B-scan was not larger than the corresponding disc SLO image. This difference can be attributed to the fact that in the absence of marginal lesions or blood vessels, the scleral canal is accurately registered without obscuration caused by optical shadowing. Also, the location of a druse within the nerve head and relative proximity to the disc margin influences the measured disc size based on RPE termination. Similarly, the presence of peripapillary atrophy in normal eyes can also affect measurement of disc size. Therefore, a consistent difference in the RPE-based disc size cannot be expected between eyes with ONHD and normal eyes. In similar fashion, we propose the serial measurement of posterior shadowing to assess lateral expansion of the drusen. A third parameter to reflect a progressive fullness or obliteration of the cup is the relative position of the base of the cup to an arbitrary reference point. In our study, the most consistent, easily discernible, and reproducible reference point was the level of the pigment epithelium. Although this level was generally disparate on either side of the nerve head, for reference, the side with the flattest registration of the pigment epithelium was assigned. As expected, the central cup was more shallow and ill defined in our study patients compared to 12 optic discs in normal healthy volunteers. Retinal thickness maps and coronal scans (C-scans) have obvious utility in the study of retinal and macular pathology22; however, for the imaging of the nerve head, ONHD were poorly delineated on C-scans, likely due to the rapid change in contour along the z-axis. Thus, we do not propose C-scan parameters of the nerve head to follow morphologic changes associated with ONHD. The frequency of visual field defects in adults with ONHD has been reported to range from 24% to 87%, with the highest rate of occurrence in eyes with superficial drusen.12,13 Visual field loss was noted in only 1 of 9 (11%) eyes in this study. This disparity can be likely attributed to the small sample size. With a larger cohort and a long-term investigation, a higher incidence and progression of visual field loss would be expected. A study conducted by Johnson et al. compared 20 eyes with ONHD versus 20 eyes with optic disc edema and 20 normal eyes.25 Qualitatively, they observed that eyes with ONHD had “lumpy-bumpy” internal contours, whereas eyes with optic nerve edema had smooth internal contours. Quantitatively, a peripapillary subretinal hyporeflective space was identified in both groups. However, in eyes with optic nerve edema, this hyporeflective space was observed to be thicker at a greater radius (2.0 mm) from the center of the disc, whereas in eyes with ONHD, this space rapidly tapered off. Additionally, the nasal retinal NFL thickness was found to be greater than in eyes with ONHD. There are several limitations of the current study. The first concern is the operator-dependent selection of the cross-sectional B-scan. Given the irregular three-dimensionality of ONHD, it is conceivable that differently oriented sections may overestimate or underestimate lesion size. Also, the authors recognize that a marginal drusen shadow may obscure the RPE tip. However, because the main point of interest is relative change over time rather than the absolute value at a single point in time, we believe that the selection of the B-scan can be nonspecific, provided that the geometric center is registered while avoiding marginal blood vessels. Accordingly, the second concern is the ability to reproduce the scan for longitudinal monitoring. This depends largely on the operator’s ability to select a similarly oriented B-scan. With close attention to disc anatomy (as demonstrated on the corresponding SLO image), it has been our experience that the same or a similarly oriented scan can be identified for purposes of measurement. Of note, with the latest version of the OCT/SLO system, the spectral-domain algorithm offers multi-examination analysis of progression and/or regression at each point of the topographic comparison maps. With the user selecting the baseline examination for the comparison, the analysis generates reports with thickness and volume changes over time. This automatic selection of corresponding scans obviates the concerns of manual selection and erroneous tracking in our proposed parameters. We also acknowledge the relatively small sample size in our investigation. Because our primary intention of this pilot study was to survey the application of this technology to a known pathology, we hope that a larger sample of patients would help determine statistically significant differences compared to normal optic discs or changes over time (using the newer spectral-domain models). Our series illustrates the high-resolution capabilities of the OCT/SLO technology in contrast to standard techniques. Although ultrasonography offers the highest sensitivity for the detection of ONHD, the possibility of missing small lesions exists as expertise and experience of the ultrasonographer become important.1 The combined OCT/SLO offers improved visualization of ONHD size and morphological changes of adjacent retinal structures. With the advances of spectral-domain registration and improved light-source technology, the multiple transverse scans of high axial resolution will likely result in increased sensitivity in detection of both buried and visible lesions. Although a larger, prospective study may be required to compare the capabilities of OCT/SLO to other imaging techniques, this study found that OCT/SLO revealed unique and clinically helpful views of ONHD. With further, long-term studies documenting disc diameter, width of posterior shadowing secondary to drusen, and relative height of the optic cup, the OCT/SLO may help answer previously studied questions of ONHD pathophysiology. For example, temporal progression of buried to visible morphology and critical points in location and size resulting in NFL damage. Kurz-Levin MM, Landau K. A comparison of imaging techniques for diagnosing drusen of the optic nerve head. Arch Ophthalmol. 1999;117:1045–1049. Spencer TS, Katz BJ, Weber SW, et al. Progression from anomalous optic discs to visible optic disc drusen. J Neuroophthalmol. 2004;24:297–298. Floyd MS, Katz BJ, Digre KB. Measurement of the scleral canal using optical coherence tomography in patients with optic nerve drusen. Ophthalmology. 2005;139:664–669. Wilkins JM, Pomeranz HD. Visual manifestations of visible and buried optic disc drusen. J Neuroophthalmol. 2004;24:125–129. Lorentzen SE. Drusen of the optic disk: a clinical and genetic study. Acta Ophthalmol Scand Suppl. 1966;90:1–180. Savino PJ, Glaser JS, Rosenberg MA. 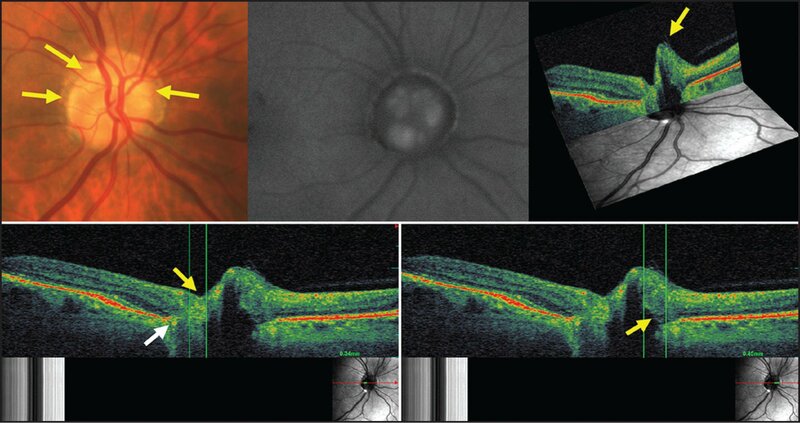 A clinical analysis of pseudopapilledema: II. Visual field defects. Arch Ophthalmol. 1979;97:71–75. Gittinger JW Jr, Lessell S, Bondar RL. Ischemic optic neuropathy associated with optic disk drusen. J Clin Neuroophthalmol. 1984;4:79–84. Wilhelm JL, Gutman FA. Macular choroidal neovascular membrane with bilateral optic nerve drusen: case report. Ann Ophthalmol. 1983;15:48–51. Harris MJ, Fine SL, Owens SL. Hemorrhagic complications of optic nerve drusen. Am J Ophthalmol. 1981;92:70–76. Brown SM, Del Monte MA. Choroidal neovascular membrane associated with optic nerve head drusen in a child. Am J Ophthalmol. 1996;121:215–217.